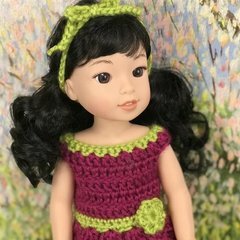 Showing results for tags 'crochet doll pattern'. Hello everyone, I just wanted to share three of my most prized projects that I have made, and have also offered the patterns for sale. All three patterns can be purchased in my etsy shop as a package deal for $12.00. Here is a group photo of all three of my dolls: The matryoshka dolls were my first project. I have a couple of little kiddos, one of which liked to break everything he touched (at least it seemed like it ). So, I decided I needed to make myself some lovely, unbreakable matryoshka dolls.... they have been thrown across the room multiple times, and still look lovely as ever. The other two dolls were made as gifts for my daughter. She loves ballerinas, and I was so happy how the ballerina turned out. The last doll, Millie with the blond curls, was a redo of a project I made for my daughter a long time ago. I really had loved the doll I had made for her a couple years ago, and I wanted to give the doll a cleaner, more put together look. Mission accomplished. This time she was made using all cotton yarn, has sparkling blue eyes, and darling little ringlets.